I have a neighbor that has a spectacular garden and it gets better every year. Dan Doersch is a retired 7th grade Science teacher who, with his wife Kitty, spend all summer tending “His Majesty’s Gardens”, as the sign out front on the lawn announces. Besides starting all his annual seeds in a lean-to greenhouse, he is also very involved with dwarf conifers and evergreens. As a member of the American Conifer Society, their yard was one of three locations in the Green Bay area featured on the ACS Convention garden walk. I happened to have mentioned earlier this summer that some day I’d love to bring a few friends to see his place. I contacted him the other day just before he was to leave on a fishing trip to set it up. One morning Mary, Sue, and Jill met me and Susan at Sissy’s Treats and Treasures for coffee in Seymour before our visit. We shared lots of laughs and new friends were made. Dan and Kitty Doersch share their love for horticulture and over the years have molded the 40 acres into a work of art. (I might add that my father-in law sold Dan’s father that 40 acres back in 1970.) Dan hybridizes hemerocallis and Kitty has her own black velvet petunias. I almost wish we had visited my yard first and then gone to the Doersch’s. Mine seemed rather ho-hum after walking on the paths and around the pond to the back of the house to see Dan’s new bigger and better greenhouse going up. When I saw the seedlings for this year’s new 7th grade students, a small Mimosa called Sensitive Plant, it reminded me of the plants my two boys brought home for Mother’s Day when they were in Mr Doersch’s 7th grade Science Class. Love those visitors that fly in! 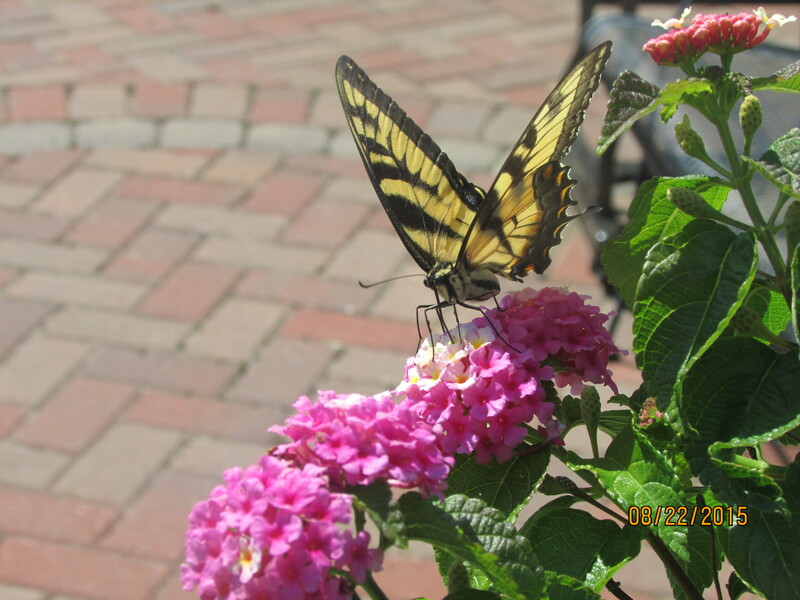 Lantana is a favorite plant of the yellow swallowtail butterfly so I make sure to plant it especially with them in mind. 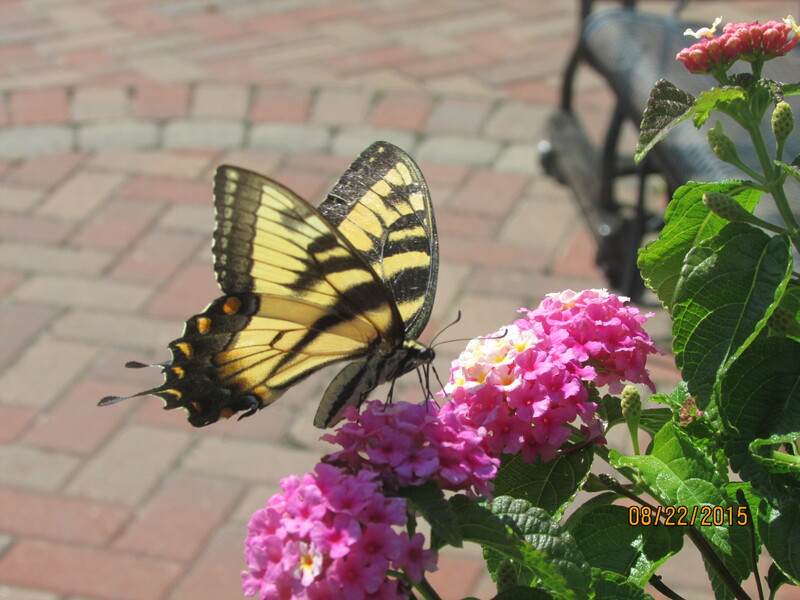 Lucky for me, I have discovered that the yellow swallowtail is usually quite willing to feast while I snap away! Most women have a group of girls with whom they do things that their spouse or significant other have little or no interest in. One warm Saturday was one of those outings for the SKIRTS. Solaris Farms in Reedsville to view and buy daylilies was the destination. Talk about eye candy! The farm is a family homestead. Nate enjoys experimenting to make a hardy daylily that can withstand Wisconsin’s winters. The family is hands-on in this business. We saw Nate out sharpening shovels and digging up plants when a customer wanted to take some home. The two children are now in college but have helped when times are busy. Kim also can be seen advising customers. We walked through the gardens that were for display and growing hybrids for future sale. I loved the bench perched atop a hill overlooking a field of daylilies. 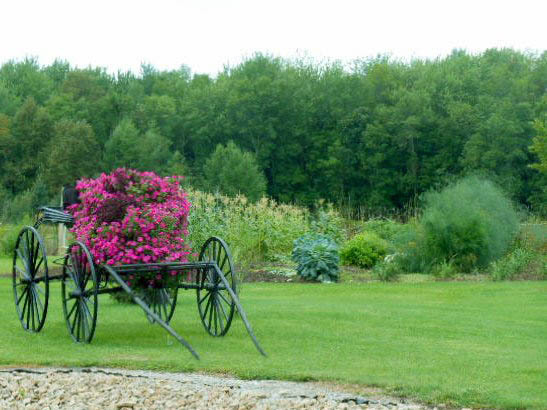 Some of the old farm buildings are used in the business and serve as a great rustic backdrop to the gardens. When we made it to the shopping area, we took our clipboards in hand and perused the rows. It was daylily heaven. There were ruffled ones, sparkly ones, tiny ones and long spidery ones. We laughed at the names; Pearls before Swine, Beyond Thunder Dome and House of Misrepresentatives just to name a few. The highest priced flower had a three digit figure. We smiled and kept walking. I was standing firm that I had enough plants. I refused a clipboard that not only carried a sheet for making a list but descriptions in detail of each plant. By the time I got to the second half of the gardens, I had to return for a clipboard. Then our plants were plucked from the earth, labeled and gently bagged for their journey home. On the drive home we came upon a plant sale at a farm house. These were home grown at that property and very healthy. As we were looking around, the owner said everything was half-price making the most expensive item $2.50. Now I lost it! Sixteen dollars later, I totally broke resolve. Just when I thought I could sit back and enjoy the garden, I have more digging and rearranging. I love my gardens. I don’t plant veggies (a few tomatoes each year is all), but I love the masses of flowers and herbs that grow around my gardens. Watching the shoots come up in the Spring and the flower buds emerge as a variety of colors: well, I just love that! Inviting people over and basking in the oohs and aahs as I humbly bow my head and mutter “oh, it’s nothing” — who doesn’t love that?! The changing of leaves in the Fall with, once again, a riotous display of colors and fragrances: again, I’m enchanted. However, I’m definitely not a summer gardener. There! I’ve said it out loud. When I go on vacation, I’m always thrilled to walk through carefully manicured pathways on either side of which are mounds of gorgeous blooms of every color, size, and fragrance. With my trusty camera in hand, I record things that “I’m definitely going to incorporate in my gardens”. Yes, I admit it — that pretty much never happens. This ‘road paved with good intentions’ is a pretty common thing in our household. Last weekend, my husband and I were at a large arts & craft fair and I saw some lovely cat tails made of copper pipes. My husband said “Oh I can make those for you”. After 33 years, I’ve learned the difference between “can” and “will”. We agreed that he’d probably get around to making them while I was out deadheading my garden. In other words, I bought them on the spot!